More people are quitting self-employment these days than were giving up two decades ago, analysis of Bureau of Labor Statistics data reveals. The figure below shows the annual self-employment exit rates calculated from Bureau of Labor Statistics (BLS) data. It indicates the number of people exiting unincorporated self-employment every year as a percentage of the number of people engaged in that activity that year. As you can see from the solid line in the figure, the exit rate fluctuates a lot from year to year, but as the dotted line indicates, the linear trend is upward. These estimates come from a combination of sources. The Ewing Marion Kauffman Foundation, a Kansas City-based Foundation focused on entrepreneurship, produces an annual index of entrepreneurial activity in the United States. One of its measures is non-self-employed proportion of the U.S. adult-age population that transitions into unincorporated self-employment every month, which it generates from the Current Population Survey, a joint effort of the Census Bureau and the BLS. Because the BLS also publishes monthly data on the number of unincorporated self-employed in the United States, we can calculate the annual rates of entry into and exit from self-employment every year since 1997. The total number of unincorporated self-employed Americans has declined substantially over the past two decades. In June 1996, 10,660,000 Americans worked for themselves in unincorporated businesses. In June 2016, 9,794,000 did. That 866,000 person decline represents an 8.1 percent fall in the stock of unincorporated self-employed people over the past two decades. The Kauffman Foundation estimates that in 2016, the 283,908 more people transitioned into unincorporated self-employment status than did so in 1997. A little basic math tells us that if the rate of transition into unincorporated self-employment has grown, but the number of unincorporated self-employed people has fallen, then the rate of exit from unincorporated self-employment must have gone down. In 2016, 226,908 more self-employed people quit working for themselves than did so in 1997. To understand what has happened, let me add two more facts to the mix. 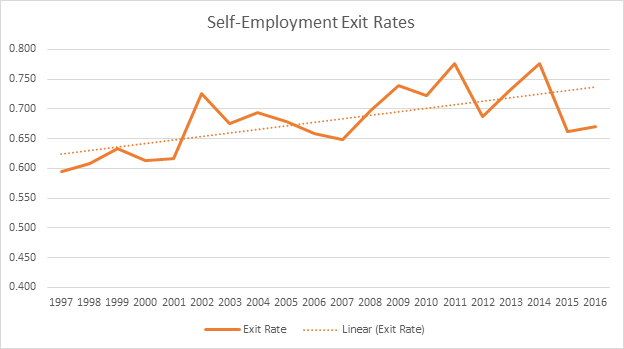 First, the rate of entry into and exit from self-employment correlated 0.87, which indicates that when one tends to go up, the other does as well. Second, the number of people entering and exiting self-employment every year is high relative to the stock of people in self-employment at a moment in time. In 2016, the estimate from the Kauffman Foundation and BLS data are that about 6.6 million people will enter unincorporated self-employment and about 6.6 million people will exit unincorporated self-employment of a base of about 9.8 million self-employed people at any moment in time. What Conclusion Can We Draw from the Rising Rate of People Leaving Self-Employment? The big takeaway from these data are that the focus on entry rates alone are deceptive. Yes, the rate of entry into unincorporated self-employment is higher today than it was two decades ago. But so is the exit rate. That’s why the number of unincorporated self-employed has declined 8.1 percent over the past two decades. Given the 18.8 percent increase in the civilian labor force over the same period, that’s a heavy slide indeed. This is because self-employment may seem enticing at the beginning but it is not self fulfilling. Budget may also be an issue as it also limits the money you earn. Aira, No, It is not simply that it’s enticing then it’s found to be hard work. Under this horrible economy, many businesses just can’t make it because people aren’t spending. They will spend on necessaties and that is it! I believe this is caused primarily by over-zealous, over-reaching, overly-complicated governmental regulations. Once laws are passed, they’re rarely ‘un-passed’ and every career politician seems to believe that their mission is to pass MORE regulation. So today what you have is regulations on regulations that most people cannot keep up with. The government itself has lost legitimacy – they issue RFPs with reams of requirements that the very person running for President of the country does not even comply with, and they make a mockery of our laws and judicial system in the process. Ask any small business owner and I would bet that 90+% of them will tell you the same things. We are fed up with over-zealous, often liberal legislators, most of whom have NEVER run a business in their lives because most of them are lawyers, who want to tell us how to run and live our lives. They are crushing the county in legislation upon legislation, that is rarely created with good intentions, created by people that don’t have the slightest clue what it’s like to have to comply with these laws. This country is slowly being destroyed by these people, who are sucking the life out of those of us who have been bold enough, and possibly naiive enough to believe in ourselves and to dare to dream in America in the 21st century. We are considering giving up a big portion of our business because of the fact that the 2 presidential hopefuls don’t make our future in business very hopeful!. All that we can say is “we are paying our bills” This is the worst economic recovery since WWII. NOT a good time to own your own business. Wait until November 9th. You will see business for sale signs Everwhere! Good Luck… Oh, we don’t have any luck. Who wants to be self employed with all of the government involvement in business today. I disagree with Aira. I have been Self-Employed for 20 years and I am very self fulfilled as I love my job. Best job I ever had even though I make less than when I worked at Micron for 7 years. Also as for money you can earn there are no limits on how much you can earn being self-employed. Compared to being an hourly worker where they dictate how much you can make per hour and how many hours a week you can work. Compared to a salaried worker that could be made to work a lot of hours for the same pay. Being Self-Employed I am commission only as is everybody at the top. Therefore there is no maximum amount of money I can earn per hour or total either. Of course there is also no floor that you could lose money on either. It takes a special kind of person to be self-employed. True Risk takers that aren’t afraid to live on less if times are tough but with the possibility of doing better than working for someone else. I’m sure Budget is an issue though because being Self-Employed is very tough. I work 100 hours a week on average. Would never do that for someone else but willing to do that for my clients because I love my job. 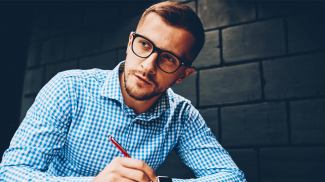 I do agree that some people find self-employment enticing because they like the idea of working for themselves and a lot of people probably don’t realize how tough self-employment can be as you have to generate the customer base also. A lot of people probably think it’s all glamour and no hard work and they expect just to make money without having to do much. Hence those type of people will not make good self-employed people. My experience is if you are a bad employee then you will make a bad boss also as you are lazy and not willing to put in the hard work it takes to be self-employed. I have never been fired from a job in my life and I’ve worked a lot of jobs. I work hard at whatever I do and do the best I can at whatever I do because that’s my job. I always tell anyone considering going into business for themselves that it isn’t for the faint of heart! As in anything else, there are a lot of things to consider and a lot of variables that can affect your outcome. 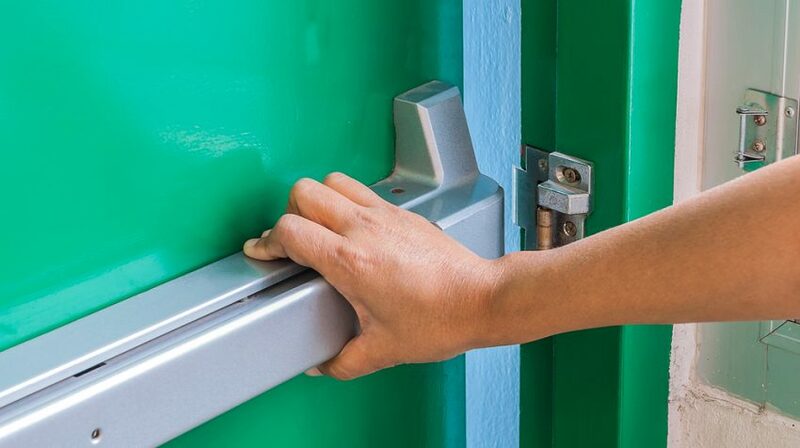 Self-employment places you at the top of your company and it is often a lonely place. I’ve got 32 years under my belt being self-employed. I’ve had a lot of good years, but even more challenges. There is one more matter for clarification. Does the self-employment exit rate include businesses that convert to corporations? I have been happily self-employed for 36 years, but the business has grown too large to remain a sole-proprietorship; I am in the process of changing to a corporation. Will I count as an exit? It’s certainly not due to the business failing. Scott, the missing piece of your article is “Why”. So, I’ll offer my opinion (which I probably wouldn’t if I could have read yours). 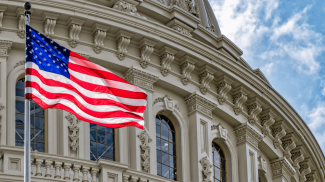 From my perspective, government (including local) regulations have continued to make it more and more difficult for the self-employed person to even add one employee and especially up to 10 employees. Self-employment will begin to increase in areas first served by automation. Self-employed people just want to work and make money, they don’t want to babysit their employees the way DOL and NLRB require. I have a totally different take. I’ve been self-employed for over 30 years and what I see is a change in consumer preferences. They now tend to purchase goods and services from national firms rather than small local firms. They do this for several reasons. #1 is price. The local retailer cannot compete with Walmart on price. #2 is consistency. Whether you go into the store in Maine or California you know what you are going to get. Finally, it’s more convenient. You can get just about everything you need with one stop. Go to any city and try to find local restaurants where you can get local cuisine. They are all disappearing. People prefer to eat at the chains so that’s about all you can find. Small businesses are on their way out. It’s not government regulation, it’s not the economy, it’s consumer preference. Look at your own purchasing habits. I’ll bet most – even those who are self-employed – are making most of their purchases from national or large regional firms. Why are my posts awaiting moderation? Why should we waste our time giving our input when you don’t allow it to show?